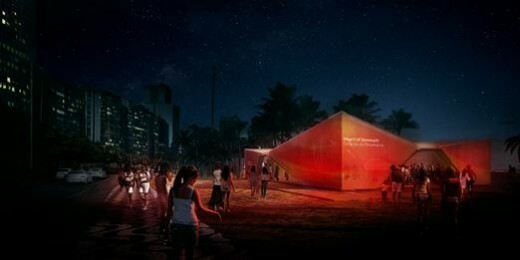 For the Olympic Games in Rio de Janeiro, taking place in August 2016, Denmark has been granted the unique opportunity to set up a pavilion on the world-famous Ipanema Beach, reports Henning Larsen Architects. The pavilion, designed by Henning Larsen Architects, will be a dynamic venue for cultural exchange during the Olympics of 2016. The pavilion will accommodate a program including sports, exhibitions, music, food and events and will be open to the public. The location right on the beach ensures a high degree of exposure and a spectacular view of the Atlantic Ocean, and the characteristic statue of Christ the Redeemer on Corcovado Mountain in the background. The pavilion is 300 m2 and conceived as a simple tent construction. It is composed of four sections of metal profiles covered with white canvas. The four structures are connected by a cross shape in clear acrylic. The open space is organized around a bar, a press room, an exhibition on sustainable cities and an amphitheater from which visitors can enjoy the spectacular ocean view or watch the Olympics on a big screen. The pavilion’s simple and light expression is a reference to Nordic architecture and to Denmark’s maritime and sailing history. The aluminum construction is by John Mast, a producer of sailboat masts, and the whole construction is covered with sail cloth manufactured by OneSails. The triangular shells of the pavilion also pays tribute to Rio de Janeiro’s hilly landscape and are inspired by the Brazilian architect Oscar Niemeyer’s iconic style. The lighting company Martin Professional, has designed a special LED lighting design to illuminate the pavilion at night. The lighting will be in the colors of the Danish or Brazilian flag, but because it is flexible, it can also be in the Olympic colors or be customized for particular events in the pavilion. Henning Larsen Architects has collaborated with the Alectia, John Mast and OneSails. The pavilion is open from the 4th to the 21st of August 2016 in the period from 11am to 10pm. Together with the Ministry of Business and Growth, VisitDenmark is in charge of the project, which is supported and developed in cooperation with The Danish Industry Foundation, Nordea Foundation, Realdania and Grundfos.